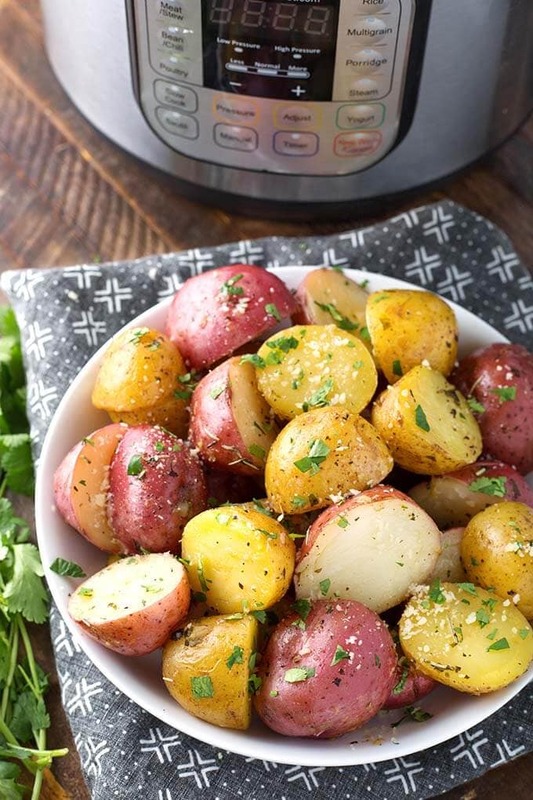 Instant Pot Potatoes with Herb Butter taste like roasted potatoes. 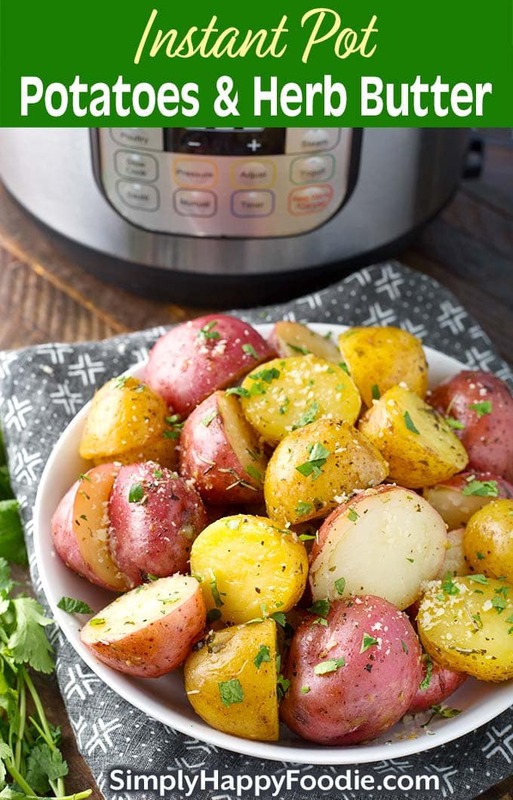 Cook these delicious potatoes in the Instant Pot and they will have a creamy texture. The butter, herbs, and garlic make these pressure cooker potatoes really flavorful. I love potatoes! The most versatile vegetable I know of. Roasted potatoes are my favorite. 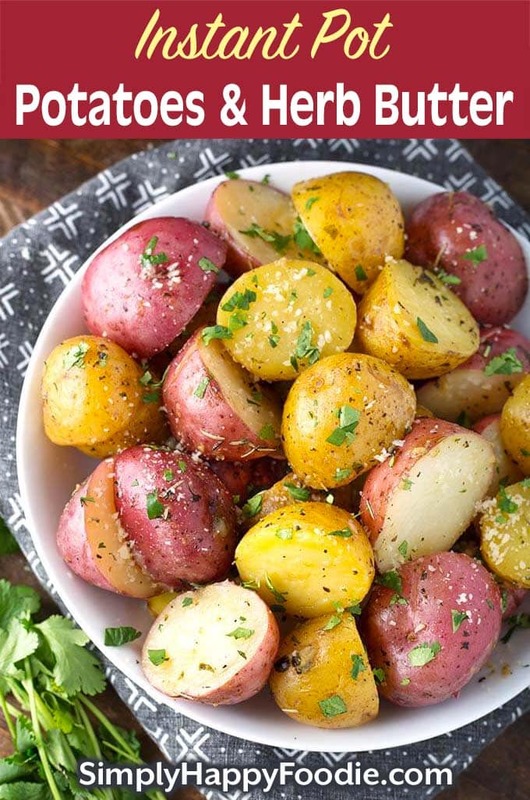 You can get the flavor of roasted potatoes when you make Instant Pot Potatoes with Herb Butter. They are delicious! I know that this is not the same and oven roasting, which is a dry environment. Crisping the potatoes up after pressure cooking is an option, so you can get some of the outsides browned. But that isn’t absolutely necessary for a delicious outcome. I like to use a combination of small (3″) red and gold potatoes (not Baby potatoes). You can use all gold or all red if you like. It’s nice to use fresh rosemary to flavor these pressure cooker potatoes, but I use dry rosemary when I don’t have the fresh, and they still come out delicious! I do use dry basil, as it holds up better in the pressure cooker. You might be wondering why I only use 1/2 cup of liquid in this recipe. The short answer is that in a 6 qt or a 3 qt pressure cooker 1/2 cup of liquid (plus the butter) is enough to bring it to pressure. If you are using a 8 qt pressure cooker, increase the liquid to about 3/4 cup. If it won’t come to pressure with that amount, bump it up to 1 cup. We are trying to get away with as little liquid as possible. 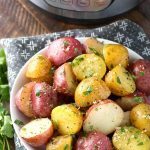 Instant Pot Potatoes with Herb Butter are creamy and taste like roasted potatoes. 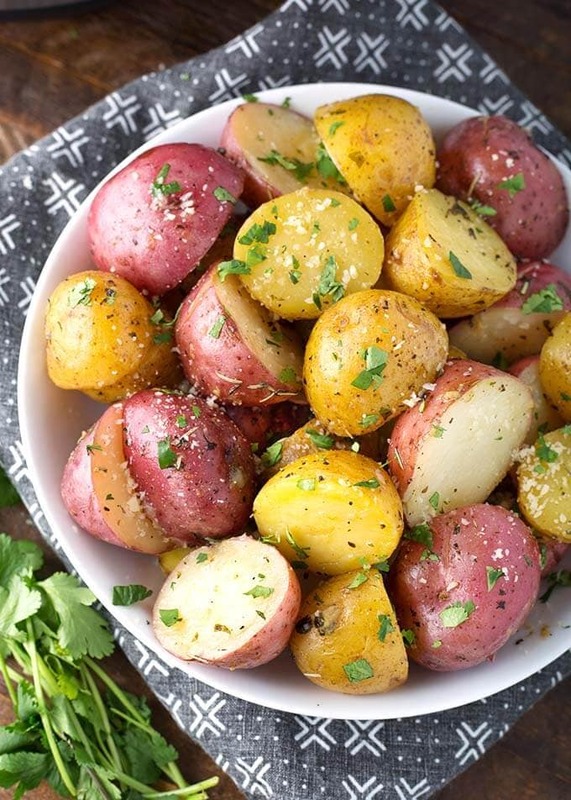 The butter, herbs & garlic make these pressure cooker potatoes flavorful. Turn on the Sauté setting of the pot. When hot add the butter slices. Stir until melted. Add the basil, rosemary, onion powder, pepper, salt, & garlic. Stir well while cooking about 20 seconds. Don't let the garlic burn. Add the potatoes and toss in the butter until coated. Pour in the water/broth. Then cancel the sauté setting. Press the Pressure Cook/Manual button, or dial. Then press the +/- button or dial to select 7 minutes (if your potatoes are larger, increase the time or quarter the potatoes). When the pin in the lid drops down, open the lid and gently stir the potatoes. If you want to crisp your potatoes, remove them from the pot (saving the buttery sauce) and place on a baking sheet. Put under the broiler for a few minutes, turning once. Watch them so they don't burn. Garnish with parmesan, parsley, and the reserved buttery sauce from the pot. These were fantastic! I used fresh rosemary and garlic. Will definitely be making these again!